LENAPE: I Never Leave Home Without It! As a photographer, I've been blessed with the opportunity to work with people from all walks of life. I've worked with some on a single project and with others on more projects than I can count with two hands. I met a man by the name of Daniel "Strong Walker" Thomas, a few years back, while hosting a "photography party". A colleague of mine and I use to rent out photography studios for the day and invite as many clients as possible. Daniel came by with his family and we cooked up some pretty nice portraits on himself and his son. This session led to a friendship being born. I've had the privilege of witnessing not only his personal growth, but also the growth of his business, LENAPE. Daniel has strong Native American roots, being the grandson of Arthur Thomas, who served proudly as Chief of the Delaware Nation for 14 years and will be remembered for his influence on the current organization and recognition of the tribe. Lenape is an indigenous word of the Delaware Nation meaning "the people"'. "Our Goal is to produce unique bags that can accompany you on whatever travels and adventures your path may bring you", Daniel said while discussing our creative ideas. I was actually in the middle of planning my third trip to Puerto Rico in November (2017); I was on my way to document life after Maria. It was during one of our conversations that Daniel decided to sponsor my upcoming trip by donating two travel bags. This was a perfect opportunity for him to be part of a meaningful project, as well as test his merchandise in real life conditions. I made it very clear to him that I was going to put the bags through some tough times and give him my honest feedback. Before I share my opinion with all of my readers, I want to make it very clear that I did not hold back during my travels. I used these bags like I would any of my other bags. I didn't take it easy because they were "new". I honestly wanted to see how far I can push them and to be honest, I have nothing bad to say about them at all! I could not be more impressed with the results. I tossed them on the ground, got sand in them, used them for equipment, supplies, etc. I literally did anything and everything with them while on the road. 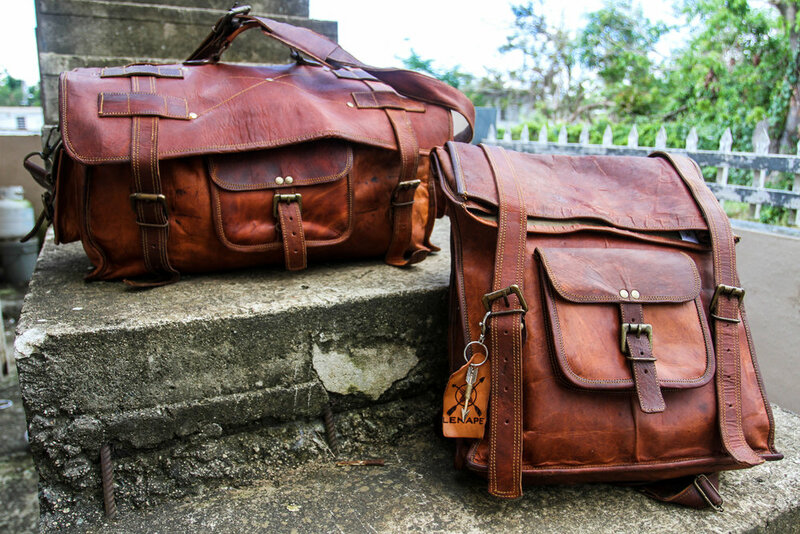 Lenape bags are made of high quality leather using a traditional process. You can feel the strength of the material and not once did I fear it wasn't going to get the job done. Both bags are spacious and allowed me to comfortably carry all of my clothes, belongings and camera equipment. I highly recommend all of my friends to grab themselves a bag or two. It's an investment you won't regret. Oh, and tell them Flako sent you!